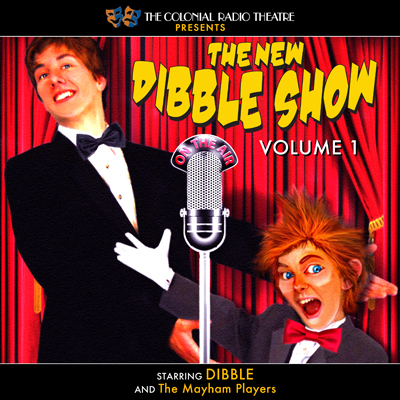 "Live from the stage of the Town Hall Theatre in Glorious Mayham Massachusetts - It's The New Dibble Show..." this is the energetic cry from announcer Westbrook Ahern that begins each episode of Dibble and the gang. The Town Hall Theatre is the place for Dibble's weekly Radio Show where he entertains his dozens of fans who supposedly listen in each Saturday night to his broadcast which barely reaches the edges of town. The Town Hall Theatre is a cavernous building that has seen better days. It seats 1,400 but Dibble and his show usually play to an empty house. Although the main focus of the program is his radio broadcast, we often get out to visit the town and the eccentric personalities who live there. He is a self-proclaimed "Professional Entertainment Legend. He is 3'3. He always has an angle. When he walks he sounds like a spider tap dancing. He has very little patience. He is.... Dibble! Town Hall Follies / Dibble And The Dentist / Moby Dibble / The Escape Artist / Hooray for Hollywood, Part 1 / Hooray for Hollywood, Part 2 / Hooray for Hollywood, Part 3. 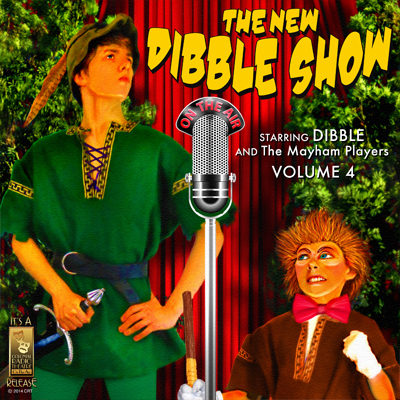 "LIVE from the stage of the Town Hall Theatre in Glorious Mayham Massachusetts - It's The New Dibble Show..." this is the energetic cry from announcer Westbrook Ahern that begins each episode of Dibble and the gang. The Town Hall Theatre is the place for Dibble's weekly Radio Show where he entertains his dozens of fans who supposedly listen in each Saturday night to his broadcast which barely reaches the edge of town. The entire family will enjoy these madcap comedy adventures from Dibble and the gang! Ep 08: SOUND DEFFECTS: Mr. Bucky takes over the sound effects table as Dibble and the gang perform "Treasure Island." Ep 09: FLIPPING FLAPJACKS: Rita needs to leave town on a family emergency - but she has entered the "Farmer Franks Flipping Floppy Flapjack Festival for Farm Grown Fluffy Flaps" - so Dibble and Jake take over her kitchen to win first prize! Ep 10: PRIVATE KNIVES: Dibble and the gang salute the sophisticated comedies of 1930's Hollywood - where men wore tuxedos in the morning and women had perfect hair and evening gowns. Ep 11: THE GREAT BARRYSNORE: Dibble and Jake travel to New York City to study with a world famous actor. Ep 12: GONE CAMPIN': Dibble's nephew arrives for the summer, and Dibble decides to take the little thug - we mean "nephew" - camping" where they encounter the dreaded Squashy Monster. 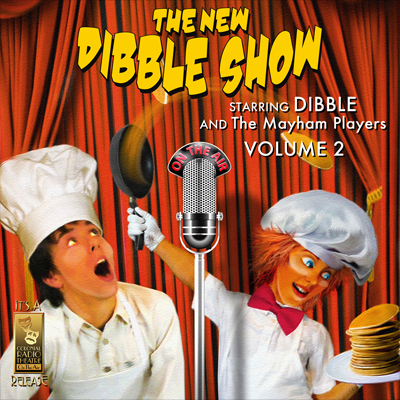 Ep 13: DIBBLE'S 4TH OF JULY SEMI-SPECTACULAR: Dibble and the gang salute America, as they bring us scenes from the Pilgrims landing on Plymouth Rock, the first Thanksgiving, Dibble Revere, Washington at Valley Forge, Betsy Ross - and a musical salute to Stephen Foster. Ep. 14: "Weren't No Picnic" The cast of the show returns for a second season, and they are all fighting with each other. Ep. 15: "The Great Bank Robbery." Bank robbers hold Dibble, Penelope Parsnip, and Jake Hostage. Ep. 16: "Deep Sea Fishing." Dibble, Jake, and Wilbur take Mr. Bucky's boat, "The Listing Lizzy," out for some fishing. Ep. 18: "Dibble's Gossip Column." Dibble causes some Mayhem in Mayham when he writes a gossip column for the Mayham Gazette. Ep. 19: "Mall Cop." 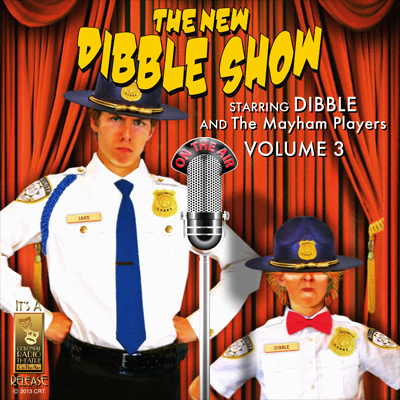 Dibble and Jake become Mall Cops at the Mayham Mall. Ep. 20: Bragging Jake Part 1 Jake tells his Aunt and Uncle from Peoria that he is the star of his own radio show. The trouble begins when they arrive in Mayham and attend the show! Ep. 21: Bragging Jake Part 2 Dibble and the gang perform their version of Robin Hood, with Jake as Robin Hood and Dibble as Little John. Ep. 22: Niagara Falls Dibble can't shut the water off in his bath tub. Ep. 23: Call My Cell Dibble and Jake get cell phones. Ep. 24: The Good Old Days In this Thanksgiving episode, Dibble and the gang remember what Thanksgiving was like when they were kids. Ep. 25: The Snow Plow After a snow storm, Dibble has trouble digging out of his driveway.